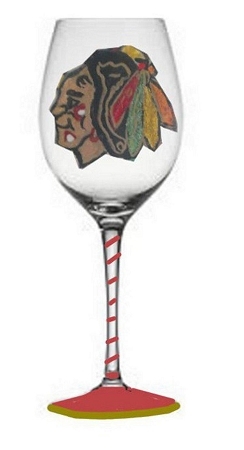 Chicago Blackhawks Ice Hockey wine glasses, Sports Glasses hand painted make the perfect hockey gift for the die hard Chicago Blackhawks hockey fan. A unique hand painted Chicago Blackhawks hockey glass is different than the regular jersey, banner, or machine printed logo duplicated on a cup or glass. These are one a kind, original Chicago Blackhawk wine glasses that you can order in wine,beer, margarita, martini glasses or whatever your pleasure is. 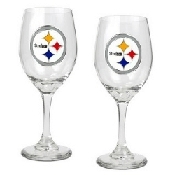 We hand paint any sports team whether it is high school, college or NFL. Give the perfect hockey gift for the sports fan in your life. We offer a large variety of types of hockey glasses.